Multani Mitti also known as Fuller’s Earth is a form of clay most commonly used for beauty and cosmetic purposes. It was originally used in the cleaning process of wool. It is also said to have been widely used in the ‘reel’ world, for various special effects, by makeup artists and as a prop to give furniture and clothes a dusty appearance. In recent years, however, the use of fuller’s earth has gained much popularity in the health and beauty care segment. In the year 2005, U. S. was the largest producer of fuller’s earth. The benefits of Multani Mitti or Fuller’s Earth are somewhat concentrated to skin and hair care. It helps remove dead skin cells, giving the skin a healthy glow and improves the texture and complexion. It helps get rid of acne and blemishes along with hydrating the skin and clearing blackheads and whiteheads. It can help with dry and flaky skin as well as treat a dark and patchy skin. It can reduce visibility of scars. As it has a soothing effect it helps calm the skin after long exposures to sun and heat. Take a spoonful of Multani Mitti, add a few drops of rose water, make a thick paste, apply to face and leave on for 5-10 minutes, before washing off with water. For a stronger pack, add orange juice instead of rose water. Mix together 1 teaspoon each of Multani Mitti and plain yogurt, let it soak for a half hour, then add to it a teaspoon of mint powder, apply this paste to your face for at least 20 minutes, then wash away with water. 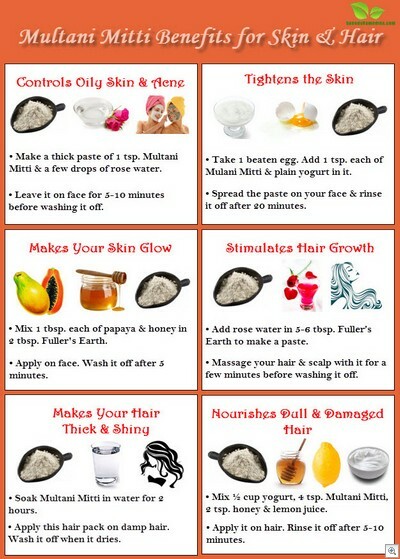 You will need a tablespoon each of honey and papaya, add to 2 tablespoons of Fuller’s Earth, use it on your face and leave it on for about 5 minutes, then wash away. Take 2 teaspoons of Multani Mitti, 1 teaspoon paste of neem leaves, 4-5 powdered cloves, a pinch of camphor and some rosewater. Make a paste out of the above components and apply to the face, concentrating on the areas affected by pimples. Leave on for 5 minutes, and then wash away with water. To use as a scrub, mix Fuller’s Earth with grinded almonds and glycerin soap, use this mixture to scrub your face with. Mix together 1 teaspoon each of Multani Mitti and plain yogurt, add to it one beaten egg, apply to face and wash with water after 20 minutes. It should be noted that before using any of these beauty masks for the first time, you should test it on a patch of skin, and if you have an extremely dry skin, then exercise caution as fuller’s earth can aggravate the condition. One other tip to be kept in mind is not to smile, or talk much when the mask is applied to the face because it can cause wrinkling of the skin. Soak Multani Mitti in some water for 2 hours; use this on your scalp as a shampoo to get thick and shiny hair. Massage your hair with oil (olive oil, preferably) after 2 hours wash it off with Multani Mitti and milk, or use buttermilk if you have oily hair. The next morning wash your hair with a shampoo. This method is said to treat split ends. Take 5-6 tablespoons of Fuller’s Earth, add some drops of rose water and apply to scalp, or massage in for a few minutes, then wash away with water. Mix together 4 teaspoons of Multani Mitti, &frac12; cup of plain yogurt, juice from half a lemon and 2 teaspoons of honey. Apply to the hair, leave in for 5-10 minutes, and then wash your hair with shampoo and condition as usual. These were some of the benefits and remedies of using Multani Mitti for your hair and skin. Although the results will be slow and steady, a regular and consistent usage of this clay in the daily regime will show its benefits.